The upcoming Oppo A7 with model number PBFM00/CPH1901 has been spotted on Geekbench today. The handset has been in the rumors since the past few months. It is expected to go official in a week or two. Today, the same phone has appeared with model numbers CPH1901 and PBFM00 have been spotted on Geekbench to corroborate on some of the specs that have been already revealed through recent leaks. 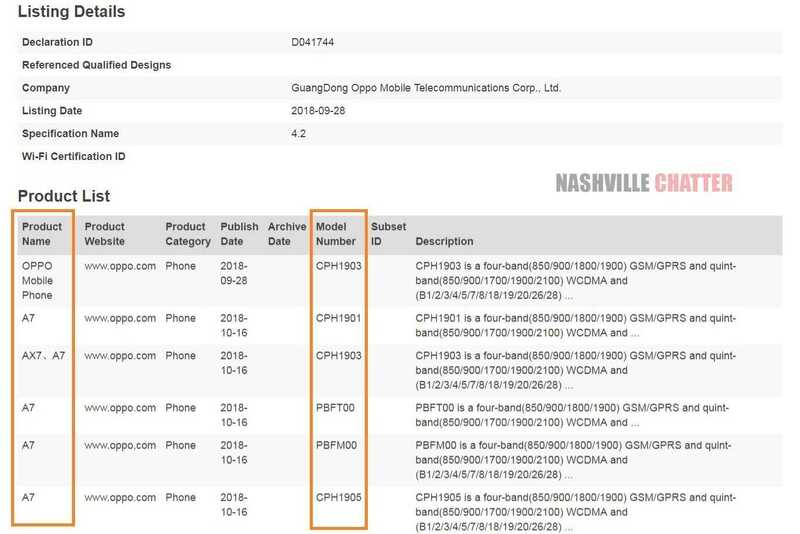 Through the Bluetooth SIG listing that had appeared in the recent past, it was confirmed that the OPPO CPH1901, CPH1903, CPH1905, PBFM00, and PBFT00 model numbers are nothing but country variants belong to the upcoming Oppo A7 smartphone. The Geekbench listings of CPH1901 and PBFM00 have revealed that the Oppo A7 is fueled by msm8953 Snapdragon 450 processor and 4 GB of RAM. It is preinstalled with Android 8.1 Oreo OS. These specs have been already revealed in the recent past and its appearance on Geekbench suggests that the Chinese manufacturer could be internally testing the smartphone’s performance. China and India are expected to receive the Oppo A7 smartphone very soon. The CPH1903 variant that has been spotted on Singapore’s IMDA certification body reveals that the handset will carry Oppo AX7 moniker. Recent reports have revealed that the Oppo A7 features a 6.2-inch IPS LCD screen produces HD+ resolution of 720 x 1520 pixels and supports an aspect ratio of 19:9. A dual camera setup equipped with a 13-megapixel primary sensor and a 2-megapixel secondary sensor is present on the backside of the phone. For shooting selfies, it is expected to come with a front-facing shooter of 16-megapixel. A battery of 4,230 mAh battery is said to be packed inside the device. It is also expected to arrive with a fingerprint reader. The handset may hit the market in Blue and Gold color variants and carry a price tag of 1,599 Yuan ($318).